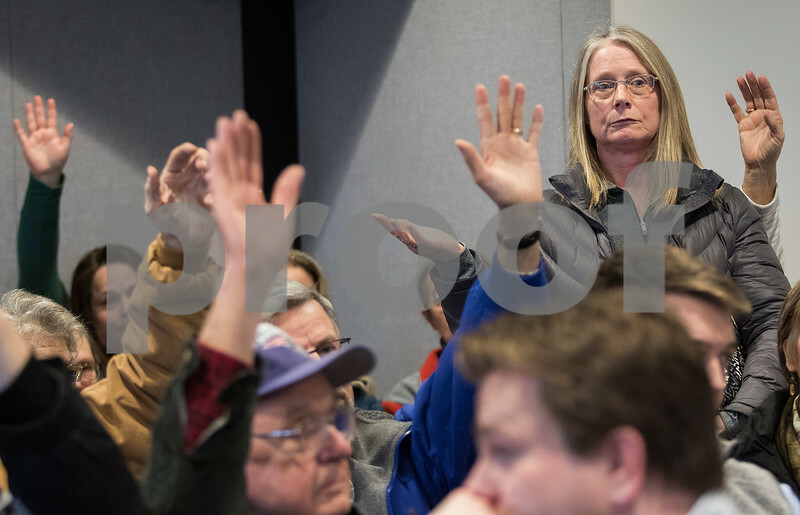 Teresa Phillips of South Grove stands and asks those in attendance during a public meeting on Thursday, January 26, 2017 at the DeKalb County Administrative Building in Sycamore to raise their hand if they object to a proposal by EDF renewable energy for the construction of two meteorological evaluation towers (MET) in South Grove Township. The two proposed towers that will be 8 inches in diameter and 200 feet tall will collect wind data to gauge the potential of future wind turbines in the area. More than 60 people were in attendance with all seats taken and more people standing in the room, the doorway, and the neighboring room.